That is the last line (and what a last line!) of Yeats' poem "Byzantium" - one of the few things I had in my mind about Istanbul when I found out we were going there. He's probably really talking about the Sea of Marmora, at the southern shore of old Istanbul, back in the golden-frescoed Orthodox days of the Byzantine empire - but I kept thinking of that line as we took a ferry up the Bosphorus and back. 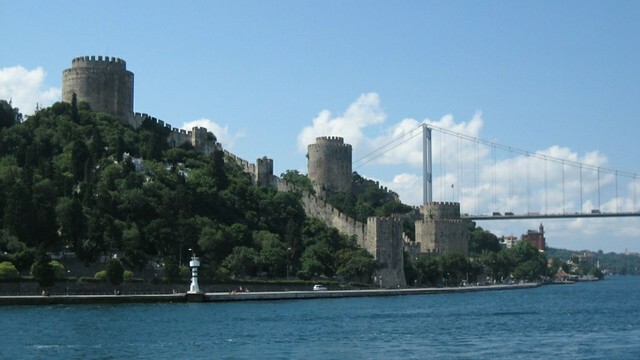 The Bosphorus is the north end of the water link between the Black Sea and the Mediterranean. It is about 30km long and only 700 meters across at its narrowest point. It is the only way for ships to get from the Black Sea to the Mediterranean and then to the rest of the world (and vice versa), so it has always been and continues to be of vital strategic importance, both commercially and militarily. It is also very pretty, has cool ocean breezes, and has been prime real estate for several thousand years. 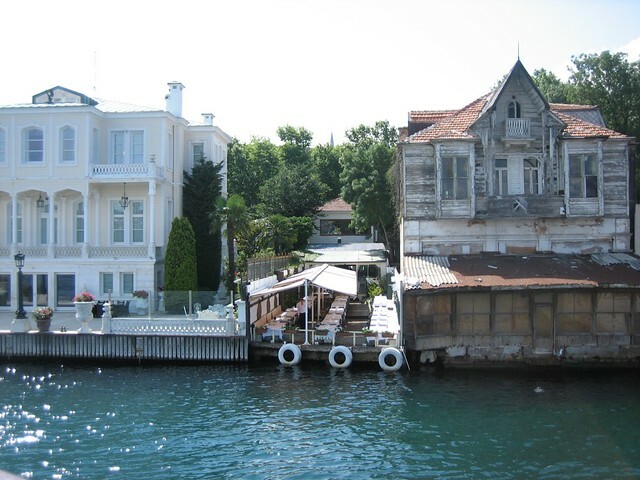 The megalopolis of Istanbul spreads about half-way up the Bosphorus, and the rest of the shoreline has villas, castles, old palaces, and scenic villages. 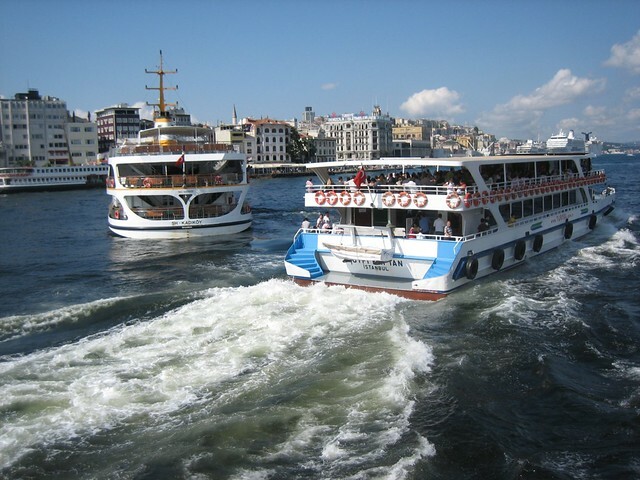 There are many ways to tour the waters around Istanbul, but one of the easiest is to take one of the large ferries that leave several times a day from just near the Galata Bridge. They have lots of seating options, both indoors and out, and have their own canteens and waiters who will bring you tea, ice cream, or Nescafe. 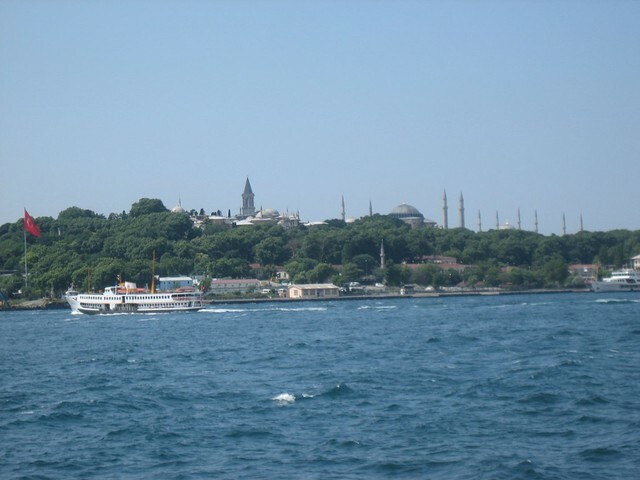 As you leave the Golden Horn, you get a great view of Seraglio point, with the Topkapi palace, and the domes and minarets of Haghia Sophia and the Blue Mosque. 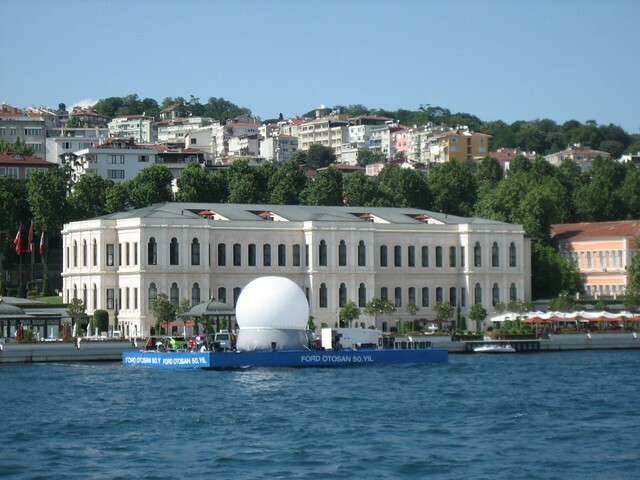 Further along, you pass the newer neoclassical Imperial palaces, mixed in with museums and shoreline entertainment complexes. The Bosphorus is spanned by two large suspension bridges, which remind me a lot of the two bridges in Halifax - except that instead of going to Dartmouth and Cole Harbour, they have big signs that simply say "ASIA". All along are beautiful wooden villas and manor houses - the extensive use of wood shingles and siding in Ottoman residences reminded me of houses in Halifax, while at the same time being completely different. The Bosphorus is full of ships of all kinds. Pleasure yachts and outboard skiffs dodge between ferries and cargo tankers. It's busier than Halifax harbor, but most of the cargo ships seem to be smaller than the ones I see pulling into Bedford Basin - perhaps the Black Sea and Mediterranean aren't quite as tough on shipping as the North Atlantic? The ferry stops at a small village near the entrance to the Black Sea. This is the furthest that I've been into the continent of Asia - about 500 meters. Above the village is the ruins of a 12th century castle built by Italians during one of the times that they were making a play to control the Bosphorus. 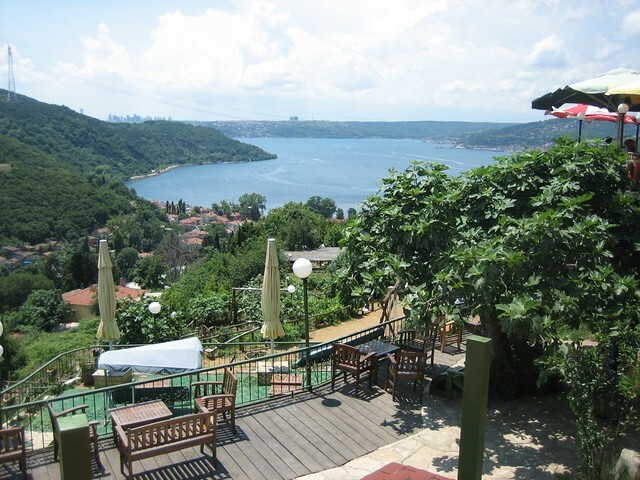 It has spectacular views in one direction of the Black Sea and in the other of the northern Bosphorus, with the towers of downtown Istanbul on the horizon. Just below the castle are the inevitable terraced patios, where you can have a tea or a beer or a döner while looking over the blue ocean and the hills of Thrace. As for dolphins and gongs: we did see dolphins, jumping near our ferry when we near the opening to the Black Sea. There were no obvious gongs, but as we disembarked, the waves were crashing against an iron pier and the gangplanks, making a violent clanging sound, which I couldn't help but hear as 'tormented' - to make poetry happen in your life, you need to use your imagination. It was a very scenic trip on a very nice summer day. There are more and larger pictures in my Flickr set of the Bosphorus.